Morgan City Rentals offers a line of man-riding winches which are designed and manufactured to standards and specifications established by offshore regulatory bodies for the purpose of lifting people. 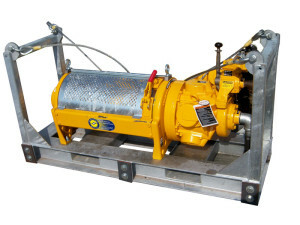 Lifting personnel with these winches is strictly limited to offshore marine applications. Man riding winches should be only operated by trained personnel. Each rental man-riding winch is transported on an engineered and certified skid package with certified lifting slings. * Warning: 120 MAX air pressure on all air hoists. Proper CFW / 90 PSI must be maintained to ensure braking system works correctly. Lack of CFM/PSI will cause brakes to not release causing failure! NOTE: Morgan City Rentals can supply and install new domestic or imported wire rope and any specialized fabricated sling upon request. No charge for spooling/un-spooling of cable purchased from Morgan City Rentals. Spooling/un-spooling of a customer owned wire rope will result in a nominal charge.